Dashboard is a group of charts, text and media content. Inside the dashboard, charts can be organized on dashboard tabs to break charts into different meaningful groups (e.g., Acquisition, engagement, etc.). From the Dashboards page, click the plus button from the bottom right. 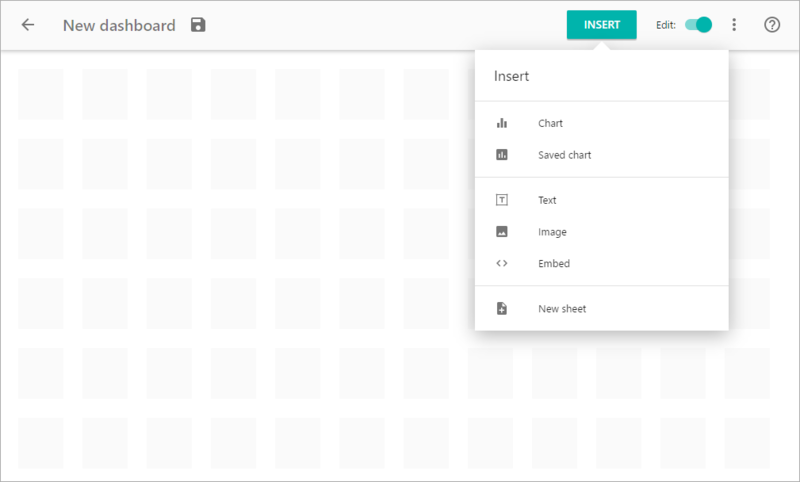 You’ll see a Choose a dashboard template window, where you can connect one of the pre-built templates to your data source, or start creating your own dashboard from scratch. Dashboard Template is a pre-designed dashboard added to an account. Slemma offers a library of dashboard templates to the customers. Team admins can also create their own templates and add them to the team dashboard library (note that adding your own templates is available starting from Small Business Plan). From the Choose a dashboard template window, select one of the templates you want to use (note that in the template’s name, we use the name of the integration which you’ll need for this template). Slemma will ask you to connect to your data source. If you’ve already created the required integration, Slemma will suggest you to connect this integration with the template. If you didn’t create integration with the service which is required for this template, you’ll be suggested to create it first. 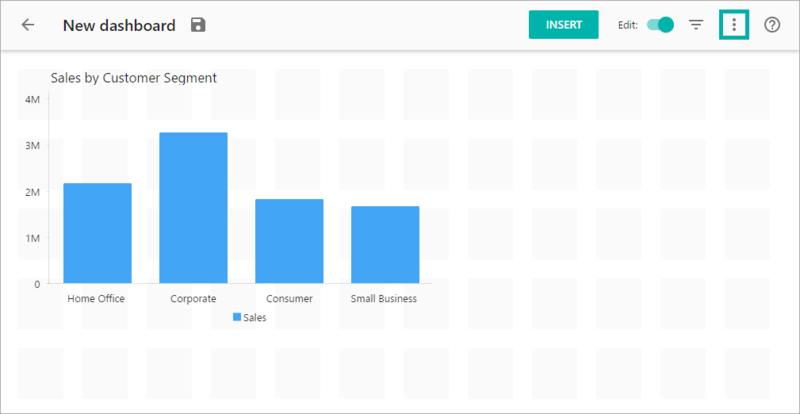 After you connected your datasource with selected template, Slemma will load data and calculate charts. You’ll be able to replace, remove and change any element of the dashboard. To create a new dashboard from scratch, from the Choose a dashboard template window, select Blank. This will redirect you to a page where you can create new charts and insert text, images, shapes or web content. To create a chart, select Chart. Read this article to learn how to create charts. Once your chart ready, click DONE in the Chart designer. This will add a chart to the dashboard. NOTE: The number of charts within one dashboard can’t exceed 30. To add one of the previously saved reports, select Saved chart. You can’t edit saved charts from the dashboard, but you can apply dashboard filters. You can add some text blocks by selecting Text. Click the gear wheel icon to see the formatting options available for the text block. To insert web content, click Embed. Please note that some URLs don’t allow to insert their content into i-frame. Inside the dashboard, charts can be organized on tabs to break them into relevant groups of your choosing (e.g., Acquisition, engagement, etc.). 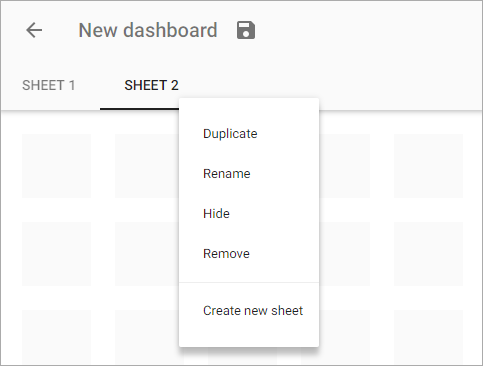 To insert a new sheet, click the INSERT button and select New sheet. Hover over the sheet name. Click the arrow that appears near the sheet and you will see the sheet drop-down menu. Hide sheet. When enabled, the sheet won’t be visible in the view mode. To reorder tabs, hold the sheet name and drag and drop the sheet where needed. At Slemma, we make it possible to customize almost everything. You can set a dashboard’s layout (Floating/Tiled), size, theme (Material design/Flat/Custom), background (for Flat or Custom themes), margins etc. to make your dashboard fit your requirements. To see the dashboard settings, click the three dots icon at the top right corner. To learn more about chart customization, go here. Tiled (default) – tiled objects are arranged in a grid that adjust in size based on the total dashboard size and the objects around it. As you choose this layout, you can set the dashboard to fit the Screen width, or disable this option and set the width manually. Inserting shapes (INSERT > Shape) is not supported in Tiled layout. Floating – floating objects can be layered on top of other objects and can have a fixed size and position. For this type of layout, you can also adjust a Paper size. For example, you may need to embed a dashboard into your blog meaning you would need to adjust it to the appropriate width. To do that, you may leave the default settings for the dashboard, or select the Fit to screen width option under the Paper size for Floating layout. In a dashboard, you can use one of three themes. You can choose Flat or Material design themes with predefine settings, or customize the dashboard elements by yourself. For charts, these options will be applied to the Chart area (the entire object), not to the Plot area. NOTE: When you switch over themes, the colors of the font are reset to auto mode (dark font on a light background, light font on a dark background). Depending on the element placement type, you can adjust the paper size settings. For the Floating type, you can choose Endless canvas, set the dashboard width, or set up custom size. For the Tiled type, you can just set the dashboard width. When you set values for width or height of the dashboard, you can set margins to make your dashboard look even more beautiful. You can set your dashboard background to create custom themes. Decide where to show the tabs for sheets, either on the top or at the bottom. This setting specifies the way how dashboard filters work.